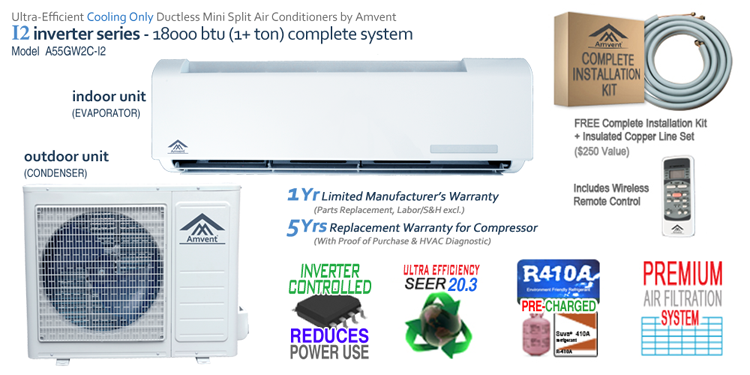 Ductless mini split air-conditioners are relatively new to North America. However, they are the most commonly used system of air conditioning throughout the rest of the world. Ductless systems are also referred to as 'zone systems.' Understandably, ductless split air conditioning systems are becoming more popular in homes and offices, even when they are equipped with advanced central air conditioning system. By providing zone cooling, Amvent ductless split system air conditioners save energy, since only the rooms that are occupied and used need to be cooled. Simply stated, they cool the 'zone' or the area in which they are installed. They require no expensive ductwork installation. This is the reason that they are far more efficient than conventional air conditioners. You can turn on the system when you want to use the area/zone and when not in use, the system can be simply turned off, saving electricity and money. Operating costs are much lower than those of central systems that cool every room, whether or not the room is in use. So, with a ductless system you can control the temperature of a zone where it is located. Therefore, you have the benefit of cooling only the room that you want, while leaving the central AC system off. 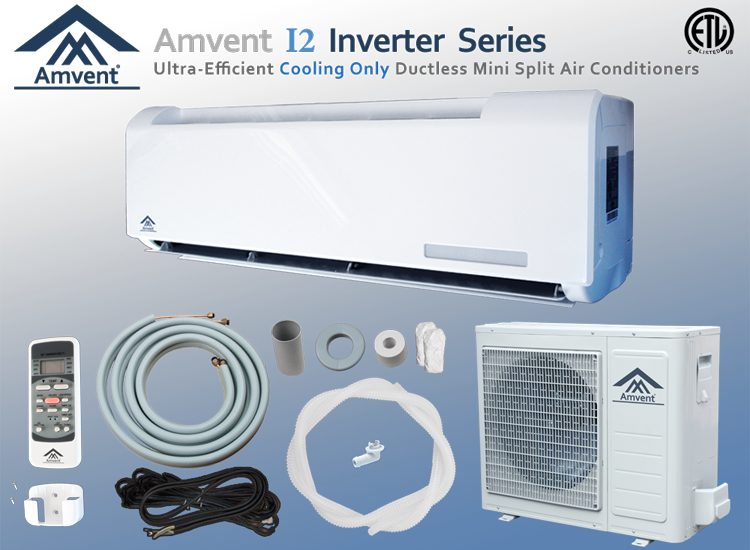 Ductless mini split system air conditioners combine the zoning flexibility of a conventional room unit (a single air-conditioner installed through a wall or a window frame) with the whole-house cooling potential of central systems. Like central systems, they have two main components: a compressor/condenser (outdoor unit), as well as an air handling unit (indoor unit/evaporator), which contains an evaporator and a fan. There are two parts to a ductless mini split air conditioning system - the indoor unit (evaporator) and the outdoor unit (condenser). Installation is extremely simple. First, the indoor unit is installed on the interior of an exterior facing wall. The indoor unit is equipped with a mounting bracket (included). This mounting bracket is secured to the wall. A three inch hole is then drilled through wall and the connecting pipes and wires are passed through this hole. The pipes and wires are then connected to the indoor unit. The indoor unit then simply hangs on the bracket much like hanging a picture frame. The wires are then connected to the outdoor unit, which is typically placed on a flat surface outside. The indoor and the outdoor units use the connected wires for power and communication. The indoor unit draws its power from the outdoor unit. Power must be supplied to the outdoor unit: You will need a 20 Amp breaker. 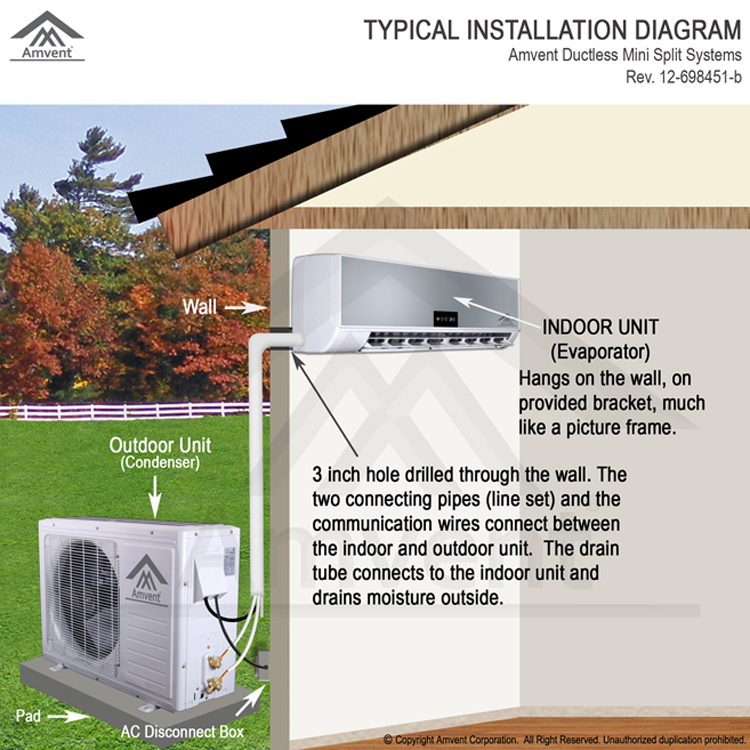 Once the indoor and outdoor units are connected, then the connecting pipes (Line Set) are attached to the outdoor unit. The Line Set comes pre-flanged and pre-flared. The final step is to open the valves on the outdoor unit opened to release the refrigerant into the entire system. COVERAGE AREA Up to 800 sq. ft.
INDOOR DIMENSIONS (WxDxH) 39.29 x 9.45 x 12.68 in. OUTDOOR DIMENSIONS (WxDxH) 33.27 x 12.6 x 27.56 in. REFRIGERANT TYPE / AMOUNT R410A - 44.8 oz. MAX PIPE LENGTH 82 ft. Customer satisfaction is of the highest priority. A dedicated and highly trained team of professional engineers, HVAC technicians and sales specialists are at your disposal for all your sales, service and installation questions. If you require technical support at any time, even during installation, our knowledgeable staff of technicians can provide you with necessary guidance and direction. We stock all parts and accessories. You may contact our technical support at (248) 230-4674. 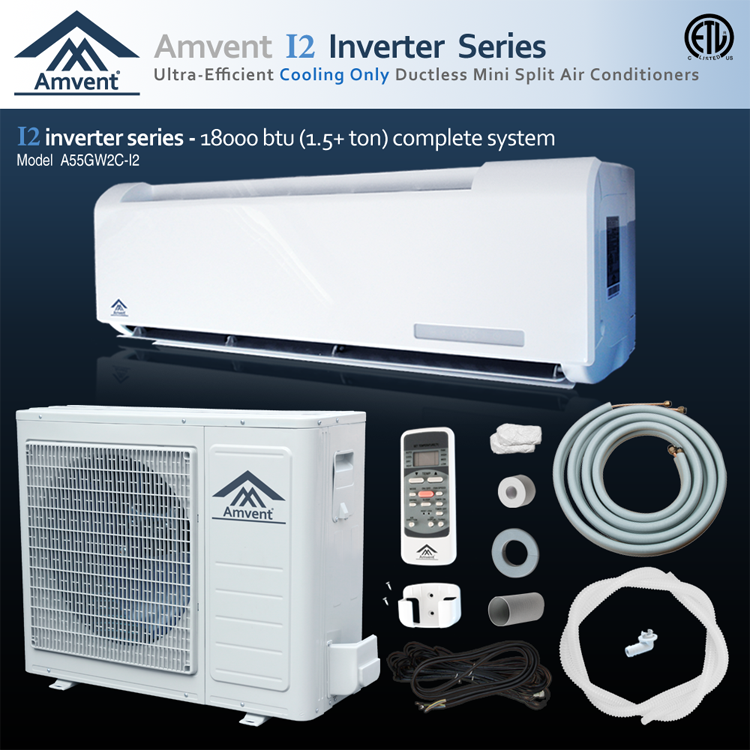 When you purchase an Amvent Ductless Air Conditioning System, you can be assured that you will receive the most reliable and highest quality system available in market today. Furthermore, you will have the piece of mind of knowing that your investment is safe and guaranteed by a reputable company. All units are guaranteed to be BRAND NEW (not refurbished or reconditioned). We DO NOT sell used, refurbished or reconditioned systems. All items available IN STOCK for immediate delivery. Your order will be immediately processed and shipped from one of our warehousing facilities in US. All orders are shipped within 1-2 business days via ground carrier of our choice and typically arrive within 2-7 business days from the date of purchase. We stock all parts and accessories for every unit we sell. IMPORTANT NOTE: Larger systems (18000 BTU output and above) are palletized and shipped to your home or business via FREIGHT CARRIER; this ensures the safe arrival and handling of your goods. The freight carrier will need your phone number to schedule a drop off time, so please make sure your phone number is in your provided contact information. If this information is not available, please either 1) include a phone number in the Notes section during checkout, 2) send us a message or email containing your phone number, name, and transaction information, or 3) simply call us at (248) 230-4674 to provide the necessary contact information. All payments must be received before product will ship. If product is being shipped to address OTHER THAN BILLING ADDRESS, we require enhanced certification of purchase including scan, image, or facsimile of the credit card used, front & back, as well as the cardholder's photo identification. We accept all major forms of payment. We are a PAYPAL VERIFIED merchant. We ship to physical addresses only. We DO NOT ship to P.O. Box, APO or FPO. We DO NOT offer combined shipping due to restrictions. Flat rate or free shipping rates, if offered, only apply to the 48 contiguous States. They do not apply to Hawaii, Alaska and Puerto Rico or other US territories. Please contact us for rates to those locations. Shipping method shall be ground shipping by UPS or the freight carrier of our choice. Tracking numbers may be unavailable up to 72 hours from the date of shipping but will be made available as soon as possible. All items will be shipped to the purchaser's address as entered. We are not responsible for errors or inconsistencies in said addresses. Please confirm your address before purchase. All items are shipped Free on Board (FOB) at our warehouse, freight prepaid. The customer takes title to the goods at the time of shipment. Shipping insurance, if purchased, becomes null and void on customer's signature when accepting goods from carrier. Claims for shipping damage will under no circumstances be authorized if there is a valid customer signature accepting products as complete and acceptable at time of delivery. WE ARE NOT RESPONSIBLE FOR TRANSIT DELAYS. For shipments to locations outside the United States the purchaser shall be responsible for custom clearance, duties, brokerage fees, taxes and other incidental charges. It is the responsibility of the purchaser to determine whether each product is suitable for import and use into their jurisdiction. For export documentation purposes, we CANNOT accommodate requests to declare the purchased item as "gift" or "sample" or undervalue the purchase amount as they are in contravention of US and Canadian law. Please note that we receive constant complaints about the duties and brokerage fees charged by UPS to our Canadian customers. Unfortunately, we do not control these charges. Canadian customers often request shipment by US Post. However we CANNOT accommodate this request due to the high rate of loss/damage we have experienced with US POSTAL SERVICE. Upon receipt of the order, the purchaser/recipient is hereby requested to open the packaging and inspect the shipment thoroughly and completely for damage. All visible damage and/or nonconformity, regardless of its severity, size or significance must be noted on waybill or other shipping documents by the customer. Failure by the purchaser/recipient to note any damage, defect or irregularity in the shipping documents shall be construed as a declaration by the purchaser/recipient that the goods were received in good order and condition and free from any defect or non-conformity. If there is significant damage resulting from mishandling of goods by the shipping carrier, the customer is hereby asked to refuse the shipment. Additionally, The customer must notify us, in writing, within 48 hours of receipt of damaged, non-conforming product. In the event of shipping loss or damage, it is the sole responsibility of the purchaser to file for an insurance claim and we will offer all necessary assistance to the purchaser for that purpose. Minor cosmetic damages that do not impact the operation or safety of the unit are expressly excluded under the terms of any return, warranty and/or insurance policy. Unless otherwise specifically indicated in the description for each product contained here, there is 1 year parts and/or replacement only manufacturer’s limited warranty from the date of purchase on products referenced above. Please refer to the item description for compressor warranty. Labor is not included in this warranty and is hereby expressly excluded. Any defective product or components thereof may be repaired or replaced at Amvent's option. The buyer shall be responsible for the process and cost of returning the faulty product or part to Amvent for repair and/or replacement. A Return Merchandise Authorization (RMA) Number must be obtained from Amvent Corporation prior to return of any equipment. Amvent shall not be responsible for faulty installation, operation or maintenance of the subject air conditioning product(s) and as such we recommend installation and assembly, where applicable, only by certified and qualified HVAC professionals. Amvent makes no representations or warranties whatsoever concerning the suitability of any merchandise for a particular use or purpose. Damage resulting from failure to use, install or maintain the product in a manner consistent with our recommendations and guidelines in instruction/installation manual shall render the warranty void. Amvent Corporation, at its option, may request a report from a qualified and certified HVAC technician/professional prior to honoring a warranty claim. Additionally, this limited warranty expressly excludes labor and/or service costs and/or fees provided by third parties. All warranties specifically excludes any consequential and/or incidental damages. This limited warranty shall be subject the laws of the State of Michigan and any claiming arising therefrom shall be interpreted in accordance to the laws of the State of Michigan and subject to the exclusive jurisdiction of the Courts of State of Michigan. Although we or the manufacturer may provide technical assistance via telephone or email to the customer, it is virtually impossible to troubleshoot all matters via telephone or remote assistance. As such, the offering of any technical assistance is made without any warranty or guarantee and provided on “as is” basis. Although we will try to provide technical support remotely (via telephone/email), in many circumstances the technical issue/problem may not be diagnosed or resolved despite our best efforts. As such, the purchaser expressly acknowledges, as an express condition of this sale, that the customer may be required to consult a professional technician for troubleshooting/repair/start-up and that any such consultation, shall be at the sole responsibility of customer and the customer shall bear all costs relative thereto. It is the responsibility of each purchaser to determine whether any particular product is compliant with and permissible for use pursuant to the applicable rules, codes and/or regulations, if any, and suitable for particular use and operation. We make no representations or warranties whatsoever concerning the suitability of any merchandise for a particular use or purpose. The details, specification and information provided herein are the full and complete information and data available with respect to each product. Do not assume the existence of any fact, data or information that is not expressly stated herein. We only warrant the information contained herein. If you purchase under certain assumptions which are not expressly stated herein, you purchase at your own risk and without recourse to us. We reserve the right to make slight modifications necessary to the merchandise for product improvement. We reserve the right to make slight modifications necessary to the merchandise for product improvement. This transaction shall be governed by the laws of the State of Michigan and any dispute arising thereof shall be subject to the exclusive jurisdiction of the Courts of the State of Michigan. By bidding and/or purchasing this item, the purchaser/bidder acknowledges that he/she/it has read and agrees with all of the policies, terms and conditions stated herein. No modifications to the terms contained herein shall be valid unless in writing and signed by our authorized agent. All sales are final. Returns are not accepted under any circumstance. To the extent we may be compelled to accept returns, they are subject to a 30% stocking fee. The shipping and handling charges are non-refundable. This transaction shall be governed by the laws of the State of Michigan and any dispute arising thereof shall be subject to the exclusive jurisdiction of the Courts of the State of Michigan. By bidding and/or purchasing this item, the purchaser/bidder acknowledges that he/she/it has read and agrees with all of the policies, terms and conditions stated herein. No modifications to the terms contained herein shall be valid unless in writing and signed by our authorized agent. BY VIEWING THIS LISTING YOU ACKNOWLEDGE AND AGREE THAT THIS SITE IS INTENDED FOR VIEWING WITHIN THE UNITED STATES ONLY AND WILL ONLY BE CONSTRUED AND EVALUATED ACCORDING TO UNITED STATES LAW. IF YOU USE THIS SITE FROM OTHER LOCATIONS YOU ARE RESPONSIBLE FOR COMPLIANCE WITH ANY AND ALL APPLICABLE LOCAL LAWS. AMVENT CORPORATION MAKES NO REPRESENTATIONS THAT THE MATERIALS CONTAINED WITHIN THIS SITE ARE APPROPRIATE FOR LOCATIONS OUTSIDE THE UNITED STATES. ANY AND ALL INFORMATION CONTAINED HEREIN, INCLUDING BUT NOT LIMITED TO INFORMATION REGARDING PRODUCTS AND PRODUCT SERVICES, APPLIES ONLY TO THOSE PROVIDED OR OFFERED WITHIN THE UNITED STATES. By entering this site/viewing this listing, you acknowledge and agree that your use is at your own risk and that none of the parties involved in creating, producing, or delivering this site is liable for any direct, incidental, consequential, indirect, or punitive damages, or any other losses, costs, or expenses or any kind (including legal fees, expert fees, or other disbursements) which may arise, directly or indirectly, through the access to, use of, or browsing of this site or through your downloading of any materials, data, text, images, video or audio from this site, including but not limited to anything caused by any viruses, bugs, human action or inaction or any computer system, phone line, hardware, software or program malfunctions, or any other errors, failures or delays in computer transmissions or network connections. Although the specifications, features, illustrations, equipment and other information contained in the site are based upon up-to-date information, and while AMVENT CORPORATION makes all reasonable efforts to insure that all material on this site is correct, accuracy cannot be guaranteed and AMVENT CORPORATION makes no warranties or representations as to its accuracy. Certain information and representations contained in the specifications, including, without exclusion, is variable and dependant on standard test conditions. This site, and all information and materials contained herein, is provided to you "AS IS" WITHOUT WARRANTY OF ANY KIND, EITHER EXPRESS OR IMPLIED, INCLUDING, BUT NOT LIMITED TO, THE IMPLIED WARRANTY OF MERCHANTABILITY, FITNESS FOR A PARTICULAR PURPOSE. No modifications to the terms contained herein shall be valid unless in writing and signed by our authorized agent. By entering and viewing this listing you acknowledge and agree that any name, logo, trademark, or servicemark contained on this site is owned or licensed by AMVENT CORPORATION and may not be used by you without prior written approval. AMVENT CORPORATION is the intellectual property rights owner of all illustrations, photographs, text and data displayed here and no portion thereof, including but not limited to the text, images, audio or video, may be used in any manner, or for any purpose, without AMVENT CORPORATION's express written permission. Modification or use of the material on this site for any other purpose violates AMVENT CORPORATION's legal rights. AMVENT CORPORATION will aggressively enforce its intellectual property rights to the full extent of the law. Sound, graphics, charts, information, or images of places or people are either property of AMVENT CORPORATION or used on this site with permission. Your use of any of these materials is prohibited unless specifically provided for on the site. Any unauthorized use of these materials may subject you to penalties or damages, including but not limited to those related to violation of trademarks, copyrights, privacy, and publicity rights. AMVENT, its model names, the stylized AMVENT and logos, specific product designations, and all other words that are identified as trademarks and/or service marks are, unless noted otherwise, the trademarks and service marks of AMVENT CORPORATION in the U.S. and other countries.